NIUSAT is a 15-Kilogram Nanosatellite developed at Noorul Islam University with the objective of creating a new modular small satellite platform for a variety of applications. Carrying a Miniature Wide Field Sensor (MWiFS) and Ocean Color Monitor (MOCM) to capture medium-resolution imagery, NIUSAT will collect a variety of information for agriculture, fishery and disaster relief. 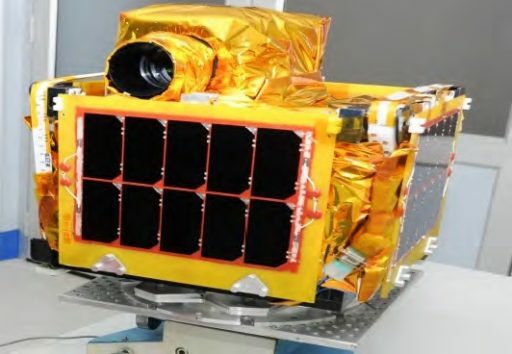 NIUSAT is 35 by 35 by 37 centimeters in size and employs a highly modular design in order to create a new small satellite platform that can be easily integrated with a variety of payloads for application in remote sensing, astronomy and communications. This “Generic Nanosatellite Bus” can support payloads up to 30 x 30 x 15 cm in size with a power of up to 15 Watts. The overall design calls for robustness through redundancy with fully redundant power, command, attitude and communications systems with design simplicity arising through functionally co-located systems, e.g. facilitating EPS components like solar panel, battery and electronics on a single panel.